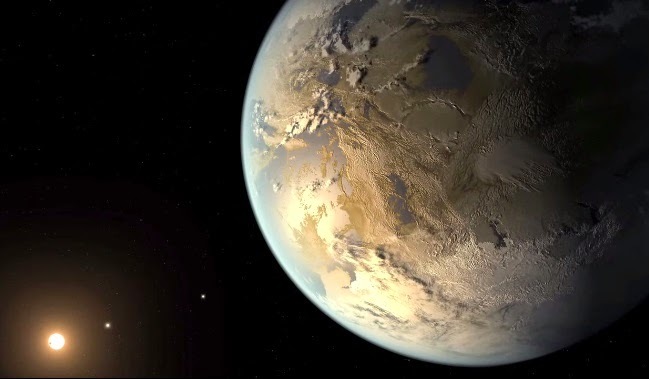 The National Aeronautics and Space Administration (NASA) announced recently that their astronomers using Kepler Space Telescope have discovered the first Earth-size planet orbiting a star in the "habitable zone" which is about 500 light-years from Earth in the constellation Cygnus. The new planet was named Kepler-186f after the Kepler Mission which is specifically designed to survey regions of the Milky Way galaxy to discover hundreds of Earth-size and smaller planets in or near the habitable zone. NASA, the agency of the United States government that is responsible for the nation's civilian space program and for aeronautics and aerospace research said that Kepler-186f size is already known but its mass and composition are not. Research adds that the Earth-like planet is most likely rocky. NASA also said that Kepler-186f orbits its star once every 130-days and receives one-third the energy from its star that Earth gets from the sun, placing it nearer the outer edge of the habitable zone. On the surface of Kepler-186f, the brightness of its star at high noon is only as bright as our sun appears to us about an hour before sunset. "Being in the habitable zone does not mean we know this planet is habitable. The temperature on the planet is strongly dependent on what kind of atmosphere the planet has," said Thomas Barclay, research scientist at the Bay Area Environmental Research Institute at Ames. The Kepler Space Telescope, which simultaneously and continuously measured the brightness of more than 150,000 stars, is NASA's first mission capable of detecting Earth-size planets around stars like our sun.